"Challenging to learn but gets the job done "
I like the email platform the best, especially that you can create a bank of emails and save them as drafts that you can modify. We run email campaigns that we schedule out ahead of time and the turnover is easy year over year when we can go back to old drafts, make copies and modify using new branding, dates, etc. It would be nice to be able to modify multiple messages at once if that feature doesn't already exist. The donation entry system is complicated and confusing, possibly just because the relationship between Luminate and our other constituent services can be complicated. Using more tedious systems for mass communication like outlook takes much more time and we have realized that using a more uniform branding made possible through email campaign templates allows us to get better rates of opening, action and response. The reports are also changing how we set goals. "Outdated aspects and an overcomplicated UI"
There’s probably more power under the hood than I’m aware of. I wouldn’t know because our org has our roles pretty well locked down and our consultants have pretty well taken over the global stylesheets and templates and make it difficult to work within the environment. - The UI of the site is hard to sort through. Buttons are inconsistently or oddly labeled and often not in a predictable location. The design looks outdated and patched together: the teal-and-bright-green of the front page icons doesn't cohere with the bright blue logo, the dull navy navbar and the various color tints used throughout the site. - Many of the features used for template development are outdated/unnecessary in modern web / email design (body tag attributes? in 2017?). - The WYSIWYG editor used for text formatting in emails and web page builders is *several dozen versions* behind. Code appropriate to modern browsers is best done by hand, which makes it much less useful for non-coder users and means I have to go behind them and clean up their WYSIWYG code. - According to our production manager, pulling reports and updating lists is a painful experience. Make sure you implement it correctly and have people who know what they're doing using it and controlling the implementation process. Don't rely on consultants. 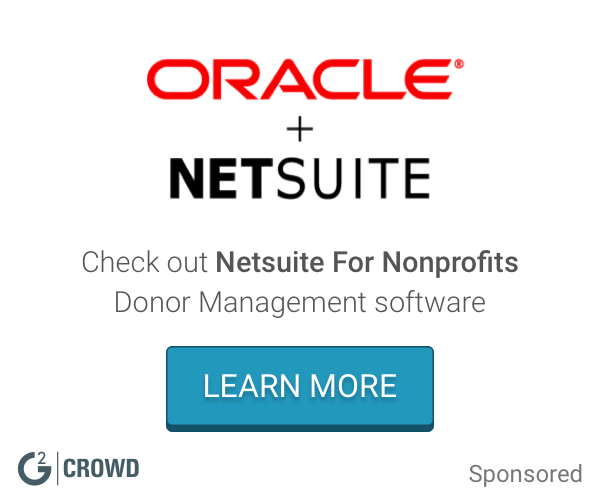 What Nonprofit CRM solution do you use? "Great CRM with Easy Customization "
Luminate Online is a good tool for organizations that want to be able to customize the information they can see and query about their contacts/donors. It is easy to navigate and there are a lot of helpful resources if needed. One negative about this system is in regards to creating reports. It comes with standard reports but we often need to create our own in order to be able to pull all the needed fields. For example there is a standard report of donations and households but we also need it to pull fields from contacts so we made our own. I have not handled many other databases at the same length of which I've used Luminate so it's hard to say which would be best but I do recommend it. There are definitely other CRMs that are clunkier and with any system there will be things you love and things you find lacking. We are solving the issue of needing a clear way to organize and view donor information and be able to track it as needed. Benefits realized are no longer having any shadow databases that may live offline or in employees personal drives. All information can be accessed in one place. "Our organization is transitioning to a different tool"
Luminate Online meets very basic needs. They are able to accommodate some particular things to our organization, like including premiums on our donation forms or the ability to schedule to unpublish and redirect a donation form. I like that they have chat support. So many things. Support is lacking. It is so complex to build in their system- for example, just creating a stationary needs to be done in a very specific complicated way. They rolled out a tweet your rep tool that needs so much work and fixing to be even usable. There are lots of little things that annoy me, too- like how it logs you out all the time, or how the WYZYWG breaks everything, or how you can only upload one image at a time. Their surveys are completely non-mobile responsive and require the most gigantic headache to build. Advocacy: there is no click to call and lots of delivery failures. Social sharing is not integrated. I could go on. Luminate Online allows us to build emails, donation pages, action alerts, manage our audience lists, and collect data for reporting. I like how donation transaction pages, emails, and transaction history are all on one platform. It easy to navigate through the portal and see how everything intertwines with each other. It is also great that it is compatible with Raiser's Edge and it easy to output and input donor data information. You are able to pull donor giving reports. You are able to create and track emails. And you are able to create donation pages that work with your organization's website. The email platform is very finicky. It sometimes takes a long time to get a simple email created. While in mail chip it is easy to move text and picture block around, it is not that easy in Luminate. The options that are available for fonts are very little and making edits is very touchy as well. If you don't make separate tables for everything, it kind of all gets bundled together. An online platform that houses donor data that we can easily pull reports from. They do a good job providing a lot of ways we can capture donor data whether it is transactional data, email opens/clicks, what campaigns they are answering to and bio information. After years of toiling through LyrisHQ, etc., the integrated features of Luminate make it easy for a one-person marketing department to seamlessly manage development and e-mail campaigns. I wish the dashboard were a little more intuitive at times. Luminate offers helpful applications to fully staffed marketing departments and small non-profit staff alike. Because it's a Blackbaud product, it's incredibly helpful for e-commerce use, and the e-mail/form campaigns are easy to develop and use. Just a pro-tip for those less accustomed to such intensive software: do make sure to complete each of the form/campaign trainings - it's more user friendly if you have a level of comfort with more technical platforms (e.g., the polar opposite of something like, say, Constant Contact, which relies strictly on visual editors). We're better able to segment our campaigns, both fundraising and e-mail, on one singular platform. "Challenges increased as BB stopped upgrading and maintaining Luminate Online product"
Consolidation of critical onlineFR functions, under Luminate Online umbrella. Chat support/case assignment system so much better now. Also, integration with BB database of record is a well oiled system. would require resources and time if ever migrated. huge issue is that default products are not mobile responsive out of the box. forces customers to go third party developer for building it on top of LO. complicates any user issue after that. does not solve business problem, as much as fills role for function of basic online FR products like email, donations, some auto-responder automation for trigger emails. "It works but might not be your best solution"
It has many features including things like auto-login when donors click on a link. It's relatively easy to use. and was a stable platform. It did allow us to increase our online donation results. It has some good tools for reporting on email campaigns and their results, who donated to what projects based on the emails we sent them. They were able to work with our existing payment gateways which made setting up payments easy and did not cause us to incur any other fees with implantation. Integration with our internal systems was not great. It was sometimes difficult to get data out of the system and EFT recurring payments were inconsistent. The email creation tools are there but by and large they are more for people with some type of HTML background. We replaced their email functionality with ActOn and it is a much better "non-technical" platform for email generation/deployment. We switched out to a software package that more completely integrates in with our internal software. If this will be your primary mechanism for taking donations it's pretty good. Most of our issues revolved around integrating it in with our internal donor management software. We used it for an on line donation portal and for email marketing. As a tool it did accomplish the goals that we had. However the software itself was clunky and didn't have the finesse of some other platforms. Essentially it was software designed by engineers without the assistance of UI specialist. "Almost Seamless Word Pasting - time efficient and user intuitive "
The product required minimal manipulation in html after copying and pasting word doc text (or email text) into the luminate system. Great way to organize multiple campaigns and distribution lists. Easy to added additional recipients to a campaign or a specific email. Emails can be sent to additional distribution lists based on set criteria within the crm function of the platform. From time to time when copying and pasting material into the email template not all formatting would transfer over - including text color, font, and font size. Typically an email would require 1-2 additional proof edits to fix the formatting. Luminate allows for emails to be sent to a larger distribution list in a designed template and keeps track of basic analytics - great way to clear distribution lists and ensure that the right people are receiving the right message for their specific needs. "Quick time to market but difficult to build enterprise data solution around it." The Luminate platform does allow you to get a donation form up and running very quickly. Platform manages credit card transactions and is a single solution. Getting data back out from the platform is very difficult. Although there are published APIs they don't seem to work well and it's difficult to get support. Although it may work well for a single entity, trying to get transactional data out to subsidiaries or different departments was extremely difficult. Consider the pricing in detail if you want to deliver data to more than a handful of people. There is a hub where your users/stakeholders can grab data from reports but this was cost prohibitive for us. We also had extensive discussions about how the data would come across via the APIs. We intended to keep track of every single transaction but this became very difficult when refunds or changes came into play. If you intend to use their APIs, ensure that you test out different scenarios. Deploying a single nationwide donation solution for a federated organization. "Integration and Ease of Use"
The thing that I like best about Luminate Online is that it integrates well with our eCRM so that we're able to personalize and provide conditional content across channels based on constituent information. I dislike that, at times, the system can run slowly when running reports, queries or building email lists. Definitely an easy system to jump in and get started using. Provided tutorials and knowledgebase posts can help further understanding of the system and its capabilities. I'm raising un-restricted revenue through donations via the email channel. Because Luminate Online syncs with our eCRM, I'm able to use previous giving history to make more compelling donation asks. "Very, very powerful. More than a little complicated." The incredibly wide variety of options you have for fund raising. It is a very powerful program but there is a LOT going on here. Luminate is a big, complex, sometimes overwhelming system. Can be way too much to work with. Takes a lot of training to get to a comfortable point with it. The CRM functionality is a little weird, but it is great for email management. Learn everything you can about it after you get it. Be prepared to be slightly overwhelmed, and very challenged. Many of the people I know use Luminate for peer-to-peer fundraising, online giving, email programs, and event tickets. I like that it's pretty user friendly. I used Listrak in the past which was not user friendly at all. I've only been using LO for 7 months and I am often able to figure out anything that I need to accomplish. My manager was pretty impressed when I was able to pull reports and refund transactions without needing to be trained on it. I've tried to use "Help" links on occasion and pretty much all of them are broken. My biggest gripe is the "Send" button. It's very scary to hit "Send" when you are planning on scheduling. When I set up emails, I select the time and date I want them to go, but if I'm going to run an A/B split, it deletes that time and changes it to "immediate". One time I accidentally sent one immediate when I first started. Talk about stress! User friendly and great support. Just always testing what we can do to increase opens and click-thrus. The fundraising emails we send out via Luminate Online look great. Updating donor information and pulling simple email/fundraising queries is simple and straightforward. I'm a big fan of the Raiser's Edge/Luminate Online integration plugin (for the most part). Since my organization sends out emails for a variety of purposes not limited to fundraising, it's very useful for all those emails to be able to come from one place -- useful both logistically and for branding consistency purposes. Luminate Online as a whole is not intuitive at all. Building and exporting reports is needlessly difficult. Email coding isn't straight CSS but has some kind of special coding (as I understand it), when having it be straight CSS would make coding troubleshooting a lot easier. I wish there was a way to conduct duplicate management both in Luminate Online AND through the Raiser's Edge/Luminate Online integration plugin. I'm not entirely sure why Luminate Online has its own support portal when Blackbaud support is much better. Not to mention: why is it still called Convio support? Prioritize training, because you will need a lot of it. Learning some CSS is helpful. We have been using Luminate Online since before I started at this organization, so I am unsure what was solved specifically through this product. That being said, I doubt that whatever we used before was as easy to integrate with our CRM (The Raiser's Edge) and as easy for every one of our departments to use for their own purposes. "Good capabilities but not for an average nonprofit user"
The possibilities are endless - but you have to know how to code and the platform is very sophisticated. While most desired capabilities can be achieved, you have to have an expert on hand to do the work. It is way too complicated for an average nonprofit communications user. The events module is useless for ticketed events where you have to gather guest names - basic functionality that should be there. We are in the process of looking at Engaging Networks. Donor Drive was another great product we considered. We can't wait to get rid of Luminate Online. We do our online donations and email marketing through Luminate Online. "Great tool but training is essential "
I love how luminate online can link your donor info to email campaigns and website content. It's a really great way to segment your supporters and really target your email blasts based on their choices. I also love the autologin feature. It makes donating to your cause a much faster process for them. I dislike that there aren't more tutorials that show you how to do more of the advanced stuff. You can take classes from blackbaud but they are pricy. Consider investing in training for the individual that will be running it. It's a great tool if you know how to use it. We just made our virtual food drive responsive. We worked with a 3rd party blackbaud vendor to get this accomplished using luminate online's teamraiser tool It looks so much cleaner and easy to navigate. We are hoping this will help us raise more money this year via our online virtual food drive. "Often the bane of my existence"
Luminate offers a lot of reliable tools to help your org's fundraising efforts. They're just really terribly out of date. Their services are pretty diverse and once you get through the learning curve (which is kinda high), you start to connect the dots in how to use them. It's horribly outdated. Oh my god. When is the last time you used Netscape? I'm not talking about `navigator.appName`. I'm talking about the browser I used in elementary school. The forms they offer have "netscape fixes" within the HTML. It is pretty crazy how crappy these are. Many years ago these were acceptable, but now it looks and feels ancient. I'm surprised there aren't animated GIFs all over the page. Navigate to teamraiser section in portal. Search perfect terms to find it (you may have well over 10,000 to search through). You cannot search for the ID which is extremely frustrating. Click through manage, click through edit, click through page wrapper to identify which page wrapper it uses. Unpublish page wrapper to edit. Find version, click edit, make change. Go to publish section, click publish. Next, browser compatibility. Things like file uploads, click and drag features, open window, CSS styling of the luminate UI, ALL may or may not work based on which browser you're using. Mozilla is best for some tasks, internet explorer of all things is often best for a lot of the file upload features. Chrome will get me by for most of it, but when something just doesn't work, I have to open all my tabs in another browser and hope it will work there. THE SYNTAX FOR THEIR S:TAG LANGUAGE. oh my god what is the ugliest language you can come up with? Did they do this on purpose? It is literally a bunch of colons and brackets. It is extremely messy and difficult to work with. I dread projects that use it. It is a joke to me. I've sent screenshots to my friends to show how ridiculous it is. Can you tell how I feel about it? If not, let me just say again, that it's the ugliest thing I've seen in a text editor. I'm not sure if this review can include the CMS, so I won't get into it in detail. Just gonna say--don't use it if you don't have to. You will be much happier. Many non-profits use Luminate with good reason. It covers most of the bases that you need. It is not without struggle though. Luminate is run by Blackbaud which seems too busy trying to acquire any and all competitors to improve the software itself. My org uses it for constituent communication, surveys, fundraising, reporting, and email marketing. We achieve all of this, but often with frustration. nice looking interface, fairly user friendly after some basic training. great report capabilities. sometimes the mass-email function can be a little difficult to manage... so many steps to complete. I use this for both constituent database management, as well as special events management. Their customer support is actually pretty good and always easy to get in touch with. Their support agents are always friendly and courteous. Their API is helpful in configuring their donations forms above and beyond what their standard form can do, its also rather straightforward and easy to use. Its rather expensive for what it is. I'm not a fan of how their email system is set up, it seems rather dated and clunky. Their CMS is decent and you can do a lot with it, but its rather expensive for what you get out of if. We are able to connect with our constituents effectively. "Luminate Online a hidden gem"
I love the analytics, such as rating clients by engagement factors. I also love the seamless integration of email and donation forms and the website. Query and reporting are not as comprehensive as I would prefer. An org must have a dedicated (or at least part time) administrator who can make the most of the robust tools available in LO. Ideally you will also upgrade to LCRM. Ongoing communications with stakeholders. Analytics as far as general engagement. Customization of communications to targeted audiences. Complete ease of use. You don't need to understand coding to easily use Luminate to manage your websites both for front end and back end interface. Honestly there isn't anything I have disliked yet about the system. Sometimes creating reports can be more difficult than usual but it's typically easy enough to navigate through. Great tool for managing participants and sending mass emails. Also going in the right direction with reporting and managing financial data. I enjoy being able to manage our accounts as thoroughly as I can with Luminate. Using it to manage websites and customer info. It integrates with other Blackbaud offerings, specifically the Raiser's Edge. Development is slow. The training offerings are slim and were not catered to our organization. The current integration with RE is clunky and needs a wholesale update. During the sync process with RE, the Blackbaud team incorrectly linked the two systems which caused the system to spuriously create new ID numbers for each of our constituents. Ask more questions than you see as necessary. The Luminate offering over-promised and under-delivered. In addition, their training package (the GO! program) did not adequately meet our needs. It would be the right offering for some, but LO did not care enough to know our organization well enough to advise otherwise. We have seen benefits when it comes to reconciliation between two of our software systems. "Powerful but not easy to use"
The ability to integrate all of our online fundaring, user database / constituent profiles, and email marketing makes for a very powerful tool. While the tool is very robust and powerful it is also not user friendly and in some areas has a steep learning curve. The admin interface is clunky and very dated. Many tasks require a technical expertise beyond that of a typical user and thus may require you to frequently need outside cosultants. If you are going to use Luminate, I would definitely recommend that you partner with a vendor rather than attempt to do everything in-house. We use Luminate for all of our online fundraising as well as email marketing across our organization. The ability to target and automate emails based on user actions / data is a fantastic, but often feels like setup and maintenance takes longer than it needs to. "Definitely Could Be Better "
I'm not sure we use Luminate Online the same way that others use it, but I like that the software is totally custom to your needs. Luminate Online provides a lot of options as far as fundraising software goes. Because the system is custom to our needs, I really don't like that everything seems to cost extra. Because we are a nonprofit, we are constantly looking for better ways to do things and with Luminate Online, all of the better ways cost money. There really isn't a beneficial way for cost-effective solutions. It definitely give you the option to customize your needs. What you get is literally what you pay for. We definitely use this to house a lot of donor information. It's good for tracking donations and such. "This CRM Take A Lot of Work"
While this CRM has everything you need it to do, it does none of them well. It will do email, donation forms, landing pages, and advocacy tools. But it is overpriced and too complicated. I dislike most things about Luminate. It has everything you need for a non-profit CRM, but it is more difficult to use then any other product on the market. I would recommend looking elsewhere. This product is not moving forward, it is staying stale. Again, it fits the bill but is too complicated and far too overpriced. "Dated software, but integrates well with Raiser's Edge"
Luminate integrates well with Raiser's Edge and when configured properly, it will synchronize well. Luminate is billed as a platform that is extensible, however, nearly every customization requires expensive consultants to configure. Donation forms beyond the basic templates require custom work and additional features like peer-to-peer fundraising require the TeamRaiser module at an extra fee. Integration of Paypal will also require additional setup fees. Overall, the platform is clunky and aside from its integration from Raiser's Edge, there are many other platforms that offer similar or more functionality at comparable prices. Read the fine print and make sure that it is clear what is going to require additional customization to get things to look the way you want. Consider that there are platforms that will allow you to go on month-to-month contracts on the strength of their platform rather than locking you into a multi-year contract. Luminate allows donations to be processed and the data to be synchronized with Raiser's Edge. When it finally got working, it works well most of the time. "Glitchy email marketing platform with disappointing support"
Solid reporting function on email performance. The interface was incredibly glitchy for us, frequently freezing, kicking account users out, and not saving new content. I would often have to resort to making edits via HTML because the front-end platform was unresponsive to attempts to make style and formatting changes. Web forms were also cumbersome to edit. Convio's customer support was unhelpful if not entirely unavailable - which is unacceptable considering the price we were paying. Look at other options if your primary use is going to be e-communications and web forms. The system is clunky and time-consuming to use, and you can get a better product for less money - such as MailChimp or Constant Contact, I cannot speak to the software's other functions. Convio was used for email campaigns across a number of departments - primarily marketing, development, and membership. It also hosted a variety of web forms, including online giving pages. It allowed us to communicate with a variety of audiences, but at the cost of an inordinate amount of staff time. "Does a lot but has some big issues"
I like that you can create surveys, send emails, create reports, process and track online donations, track event attendance, and integrate with Raiser's Edge. Be prepared because customer service can be slow to respond and there are a lot of things that cost extra in order to customize it the way you need it. "Works well enough but there is a lot of room for improvement"
I enjoy the email interface. It gets the job done and gives you some options for the customization of the emails. You can do A/B testing, send different messages based on constituents locations etc. The reporting feature is very clunky. Trying to create a custom report with only the information you want can be difficult and in some instances impossible. We're solving our email marketing, constituent database, donations, and our CMS. The multiple options. It has a lot to offer but some of the options have additional steps that waste time. For instance, a survey let's everyone view results at the bottom violating people's privacy. You have to create a page and then embed it there to make that disappear. It's not intuitive compared to other new, more up to date programs. Have someone who's not technically savvy test it out. They should be able to figure out the basics especially when you compare what other companies have to offer now. "Use this product everyday- love it "
"The CRM Everyone Loves to Hate"
Powerful, many features. Very deep product. Very expensive. Hard to work with. Inconsistency across platform, some modules are vastly inferior to others. Email module pales by comparison to products like Mail Chimp. Peer-to-peer very hard to implement. Look at alternatives! There are many. Integrate fundraising, advocacy, email and peer-2-peer. Compared to what we had before (4 separate products), it's an improvement. "Luminate can be frustrating "
Ability to manage content across events or donor groups. Some features are frustrating when working with large audience groups. It is time consuming to add so many groups one at at time instead of creating a saved group made up of existing groups. This hierarchy feature is also missing on the company page set up. I think this software appeals to a large variety of needs. It's so accommodating that it's overwhelming for my organizations back end users/needs. Take the webinars, use customer support. I do think this software will meet your needs but you need to understand it first. We do love the variety it allows but figuring out the settings to give us our best outcome has been difficult. The products and features are great for any organization that needs a tool that solves more than one problem. It's archaic and needs to be modernized to meet today's demands of digital marketers. What don’t I love about this program. It allows our participants to register for our event, gives them a platform to raise funds on, i an able to send out mass emails to different groups, and pull reports! There is nothing that I don’t like about this program. We are giving a participants a way to take charge of their fundraising! It also gives us managers a way to manage what our participants are doing and the funds they are raising! "Luminate ultimately gets the job done. " The modern look and capabilities. It is more advanced than our last system and allows us to do a lot of things at once. The user interface is difficult to maneuver if you don’t know what you’re doing and there is a large learning curve. We are solving the problem of needing multiple systems do do what we are doing with just LOM and gained the benefit of being able to simplify our processes. I like the variety of reports available, and the data they provide. Managing event constituents - great to edit their profiles, passwords and details in real time. Luminate offers a one stop shop for constituent management and engagement. Some of the tools require a bit of customization out of the box. Single database to view all interactions, communicate with constituents and set up fundraisers. It's easy to read and understand the records and the information in them. The reporting tool is not as advanced. Also, needs too many clicks to get the result. Keeping in touch with the client base. Love this software! We use convio software for all of our events. I love that it is so easy for us to track our events progress, email participants, and run reports! There isn’t anything that I dislike! We utilize this software everyday at work! We solved the problem of running numbers in a timely manner, as well as being able to email all of our participants and past participants at once! "laminate online for collecting donations"
Easy to create new donation forms and copy old ones. The responsive layouts are a great functionality that work well with our website to create a good user experience . Fixing problems seems to take a while and involve several layers of people. Fundraising through online donation pages, ticketing for events, development of eCards, survey building and story capturing. "Really easy to use and organized layout"
"A little finicky, but easy to use"
Everything happens in real time - no need to wait for things to refresh. It's very straightforward and intuitive. "Why Luminate is a great system "
I am currently interning and have found that convio’s luminate system has a great training program which has really helped me learn a lot and be able to work with my team to create a strong media presence. The training sessions are pretty lengthy. This service is really beneficial! "Can process a lot a data at once"
It is online and easy to process, you can process lots of donation at the same time. It does not always process all gifts without reason or cause. Easy to use, and with little training can seek out data you need easily. Very user friendly. Limited availability to compare YOY data Not CRM friendly. We use the data to drive our behaviors, we've benefitted from having real time data to help drive our work. Convio Luminate is very user friendly. It is a great platform for constituent/participant management, event website, reporting, etc. There is nothing I dislike about Convio Luminate. We are solving issues with running reports of participants from our events. Keeping track year over year. Benefits include the appearance of the email campaign - much cleaner than other email services. * We monitor all Luminate reviews to prevent fraudulent reviews and keep review quality high. We do not post reviews by company employees or direct competitors. Validated reviews require the user to submit a screenshot of the product containing their user ID, in order to verify a user is an actual user of the product. Hi there! Are you looking to implement a solution like Luminate?